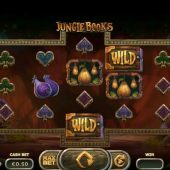 Jungle Books slot will tell you by its title precisely what it is themed about, as does Microgaming's Tarzan although Yggdrasil cannot officially name it exactly as the famous 1967 Disney Cartoon film hence the plural. You only have to see the 5 main characters in the opening sequence to confirm the aforementioned by the way! We begin with some soothing music overlaid with jungle drums and the background to the reels is an abandoned temple in the dark trees with vines hanging down to complete the atmosphere intended. The deep and secretive world of the rainforest has claimed many a foolhardy explorer in the past, so will Jungle Books result in our bankroll getting lost without hope too? Jungle Books is absolutely crazy and explaining it will probably take as long as watching the full movie the game is (ahem! splutter!) based upon. We need a good map inside this dense vegetation, so it makes sense to just look at the icons and their values first. They appear stacked and single and we pay 50 coins per play: The brown fruit pays 300, blue 100, purle 80, green 60, orange 40 and pink 50 coins for a 5-of-a-kind combination. Card suits are the other four, all paying 25 coins for a full line and Wilds pay the same as the top pay. Wild Fruit - the top-paying brown fruit acts as a Wild. Sticky Re-spin - one re-spin awarded on any win to see if more icons add. Random Multiplier - any win gets either 2, 3 or 5x. Stacked Wilds - Wilds become stacked only on the tallest reel(s). Synced Reels - think Twin Spin, adjacent reels of the same height synced. Spreading Wilds - any Wild makes another one or two random positions Wild. Win Both Ways - game becomes like Starburst while in force. 3x Wild - all Wilds involved in wins triple them. Honeycomb Bonus Symbol - added to the tallest reels and offer a pick-me when they land of 1-1000x bet. Stacked Symbol - on every spin the tablet reveals a symbol to be stacked on all reels. It's easy when you play, really! The 5 characters all have a 'Realm' when they appear on the left to become the Host. Mowgli, Shere Kahn and Baloo give you the 3-3-4-3-3 grid with 58 lines. Bagheera the Panther gives us a 4-3-3-3-4 grid with 68 lines and finally Kaa the Python 68 lines in a 3-4-4-4-3 pattern. Now hopefully it becomes straightforward from here - you have a Host on the left of the grid which is of their pattern described above and they will offer any 2 of the above 10 enhancements while the Guest on the right (who was the previous host before the Realm changed) offers one of those. This is the state of affairs until suddenly the game shakes and the new Host takes their position and the grid changes if applicable. Have 50 spins on this fun slot and all the above will fall into place.